This place is easily reach by the LRT (Masjid Jamek Stn), around 5 minute walks. Some weekends, it will be use for CSR activities, runs, even concerts. Surrounding the Merdeka Square are the St Mary Cathedral, Sultan Abdul Samad Building, Masjid Jamek, Royal Selangor Club, Textile Museum, Kuala Lumpur Gallery and Kuala Lumpur National Library. It is a very good starting point for the area. Except European countries I have seldom experienced such a nice collection of historical buildings at one place as I have observed in Merdeka Square, Kuala Lumpur. A 360 degree of nice buildings. Though, Kuala Lumpur is not as historical as Mallaka but nicely keep up of once the British colonial head quarter but really stylish buildings of Malaya makes Merdeka Square is a special place in KL historical buildings collection. Royal Selangor Club and Abdul Samad building are the few best one in this square. Most of the buildings have been protected as Heritage asset of the country. Lovely colonial architecture around the square, including some interesting gems like a gargoyle fountain hidden at one end. Great for night and day photography. Also, the Royal Selangor Club is a throwback to when Britain ruled the waves and has a lovely ambience, if you can get in. Great spot to take a rest or for the kids to have a play. Seems to be where local teens go to make out and hold hand intensely. Worth a look if you’re doing the tourist thing in KL. This huge square is a remnant of KL history. There are some beautiful examples of Indian Moghul architecture imported by the British. The green is superb. 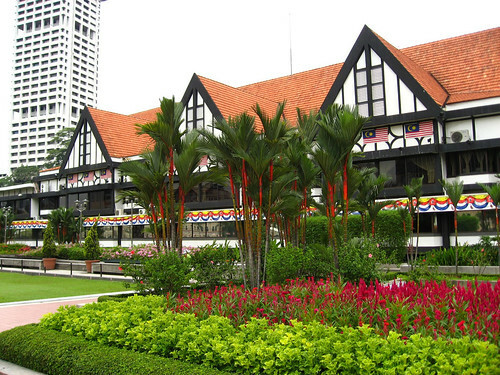 At one corner stands an old colonial Norman building: the Royal Selangor Club. Next to it, you can find a white Anglican church, St. Mary’s Cathedral, also built by the British when Malaysia was still a colony. ‘Merdeka’ means ‘independence’ in Malay. So after the country independence, the government erected one of the tallest flagpoles in the world (95m high). Just besides, there is a giant screen. Many official ceremonies take place there, like the National Day Parade (‘Merdeka Parade’). The club was nicknamed “The Spotted Dog” as two Dalmatians belonging to the wife of one of the club founders were left to guard the entrance of the club whenever they visited the club. The club is also simply referred to as “The Dog”. Effort has been made to accumulate support from various bodies to recognise the club as a national heritage building and institution, due to its intertwined link with the country’s history. The Royal Selangor Club is also known as The Spotted Dog. The theory behind the origin of the name is unknown. However, it’s believed that the name was taken from a pet Dalmatian which belonged to a former member of the club. 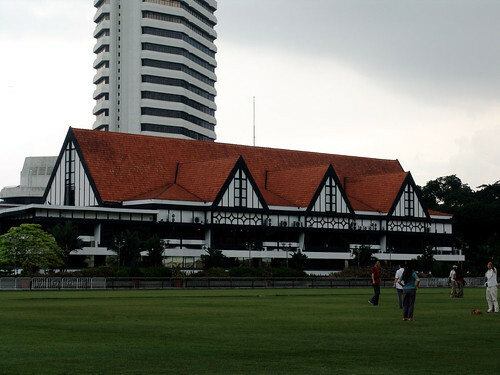 The Royal Selangor Club was established in 1884 as a socializing place for the elite in Kuala Lumpur. Expatriates and officials gathered here to relax, play billiards, and watch cricket on the field which is now part of Merdeka Square. Unfortunately, the original building was destroyed by a fire and followed by a flood in 1970. Soon an exact duplicate of the original building was constructed in 1980. Until now, the mock-Tudor edifice had hosted numerous plays and musicals. It has remains the preserve of the city’s elite. 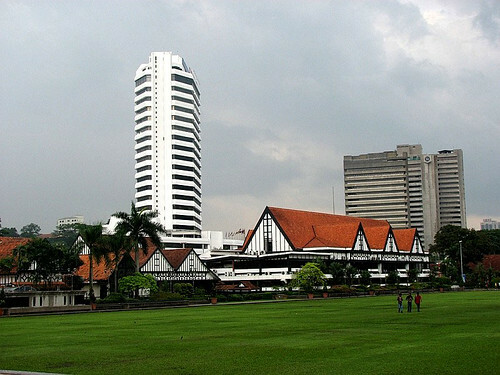 The Royal Selangor Club is located within the perimeter of the Merdeka Square. If you are planning a trip to the Mederka Square, you are encouraged to come early in the morning as other than the Royal Selangor Club, there are other places of interests here. Visit on New Year Eve celebration (Jan 1st), National Day (Aug 31st) and Malaysia Day (Sept 16th). During National Day and New Year Eve celebration, the building becomes the central of attraction where parades and possession will take place in front of the building. Every year, in the morning of Merdeka Day (31 August) as well as Malaysia Day (16 September), thousands of spectators converge on the city to watch the colourful parade along the streets of the city and performances held at the Merdeka Square. Each of the 13 states plus the Federal Territories are represented, as are the many ethnic groups that comprise multiracial Malaysia. The National Flag will be flown throughout the country, at office buildings, private homes and on vehicles. At the same time, patriotic activities to mark the holiday are held nationwide.